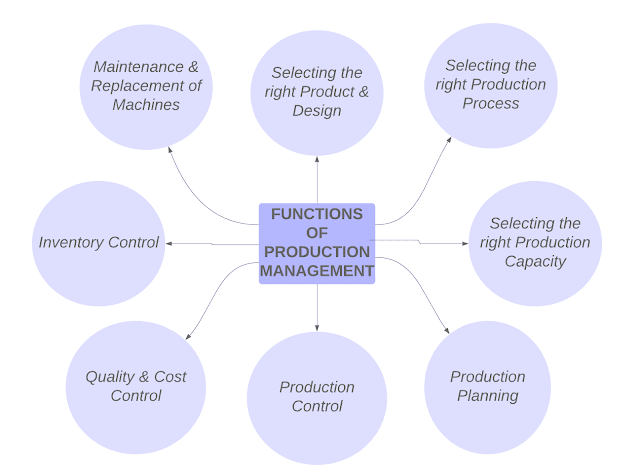 Functions of Production Management includes 8 steps. Before understanding the Functions of Operations Management or Production Management, we should know Operations Management Definition or Production Management Definition first. There are various Production Management Definition or Operations Management Definition by different authors. "It is the process of effective planning and regulating the operations of that section of an enterprise which is responsible for the actual transformation of materials into finished products." "Production Management deals with decision-making related to production processes so that the resulting goods or service is produced according to specification, in the amount and by the schedule demanded and at minimum cost." Production simply means the creation of goods or services for the purpose of consumption by society. Among the four main functional areas of management, production management is responsible for the creation and management of products or services of a company. A production process revolves around these three steps. Input could be raw materials or semi-finished product and output mean the final product/ finished product. Production process means the conversion of inputs or raw materials into the output or the final product. Production management manages all those activities which make the conversion of input into the output to meet the human needs. Production management simply means planning, organizing, staffing, directing and controlling of activities involved in the production process. It involves the application of management functions to the production function. Production management takes decisions regarding the production process so that the resultant output be in accordance with the quantitative specifications and the demand schedule with minimum possible cost. All these 6 M's joins together and completes the Production process. It is also very important for the production department to make optimum utilization of all the 6 M's. Production department helps in minimizing the cost of production. It tries to maximize the output and minimize the input so that there will be optimum utilization of all the available resources. The first or primary function in production management is to select the right product for production and the right design for the product. A product or service is the shadow of any company. A company is known for its product and product's features. A company must select a product which actually helps its end user. So, the production department should select a product in such a manner that it fulfills the need for potential customers. Product design plays an important role in grabbing the attention of people. So, the production management should select the product design by considering consumer's requirements. Choosing the right process for production is very important. The production process must be in a proper sequence. The proper method for production must be selected. The production will be either capital intensive or labor intensive depending upon the type of a product and the budget of a company. A company must select the production process which gives best result i.e. least wastage of resources and best quality of the product. To have optimum utilization of all the resources in the production process, it is very important to take proper decisions regarding machines, types of equipment, type of technology, material handling system etc. Another function of Production Management is to select the right production capacity because selecting improper production capacity may create problems in the business organization. The reason why this function is important in production management is due to an improper decision of production capacity, the company may face underproduction or overproduction of the product. Due to overproduction, wastages increases and due to underproduction, there would not be the supply of a product according to its demand and there would be dissatisfaction of customers. Hence, selecting the right production capacity is utmost important in any industry. The consequences of not selecting the right production capacity could be, Overproduction & Underproduction. Another important function in production management is production planning. Production planning includes all the activities to be planned for production. Production manager decides about two main things: Routing and Scheduling. Routing includes decisions regarding the pathway of work and the proper sequence of different operations in the production process. Routing function helps in finding the best sequence of operation a company should follow in the manufacturing process which ensures the smooth flow of work. While routing decides the sequence of operations, the scheduling function includes when to start and when to complete the production activity. Thus, production planning is important in planning for the various operations in the organization and without this function, it is impossible to have a smooth flow in the production process. 3 Ruling TYPE OF SHARES You Need To Learn! Production control is very necessary for production management. In the production department, production planning without production control is useless. A production manager must properly monitor, analyze and control various activities of production. 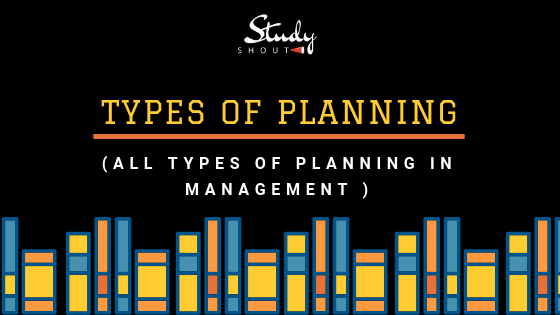 Planning function makes the plan and controlling function checks whether the activities are going on as per plan or not. Hence, Production Planning and Production Controlling are interrelated to each other. The production manager must find out the deviations or errors in the process and if any error is found he/she must take corrective actions to solve that error. Quality and Cost both are given utmost importance nowadays. The production department must maintain an ideal balance of both Quality and Cost. If a businessman provides a product of good quality along with reasonable price, the chances of retaining the same customer in the future will be increased. Due to cut-throat competition in the market, marketers always provide good quality at the cheapest rate to beat the competition he is facing. The manager should also focus on cost reduction so that the company can provide great quality at the minimum possible price. Production department should reduce the wastages of resources to reduce the cost of a product. Thus, Quality and Cost both are crucial factors of any product. Customers always prefer both, i.e. great quality product at less price. So, the production management should give importance to both, Quality Control and Cost Control. Inventory means the goods available in stock. Production Management Functions also includes inventory control. The production manager must monitor the levels of inventories. An ideal method of inventory must be chosen after considering various factors like financial factors, management, product's type etc. Inventory methods vary from product to product so it must be selected by considering the type of products the company is producing. A production manager should also take care of understocking and overstocking of the product. Both of these have their own disadvantages. Due to understocking, the product will not be delivered as per orders and there will be customer dissatisfaction. Due to overstocking, the capital will be blocked in the stock of goods and there will be a scarcity of funds. Therefore, Inventory Management and Control are very important. Some inventories require a special facility for its storage so, the company should also invest in inventory storage. Production management should also focus on proper maintenance and replacement of machines because due to daily usage of machines it needs proper maintenance. This function is one of the crucial Functions of Production Management because tool and machinery used in the production process is the backbone of the production process. Without proper machinery and equipment, it is not possible to produce a product so, the production department must take care of the maintenance and replacement of equipment and machines properly. There must be a timely inspection, oiling, cleaning, maintenance and replacement of spare parts, tools, equipment, machines etc. and it will prevent machine breakdowns and production halt. Thus, maintenance of the machine is very important for having smooth functioning in the organization and to avoid roadblocks that hurdle the production process. Each and every Production Management Function is very important and there are many consequences for violation of any of above-mentioned function. Whether it is a small scale organization or large scale, both of them include the production process. Production process should be followed by considering finance, type of organization, type of product etc. Production management is a broad concept there are different kinds of activities involved in it. 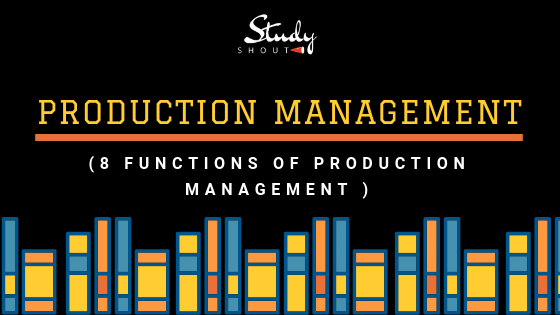 Here, you have seen some main Functions of Production Management along with Production/Operations Management Definition.